Even though my son is grown and I do not review baby items, I know I have a ton of fans that love these giveaways. We are giving away a Baby’s Journey Always Ready Changing Station. I know it can be expensive getting everything for your new baby so we love to help in any way we can. Giveaway is hosted by Miss Frugal Mommy & sponsored by Baby’s Journey. You can discover more about the amazing diaper changing station in Miss Frugal Mommy’s review! Now for the exciting part! 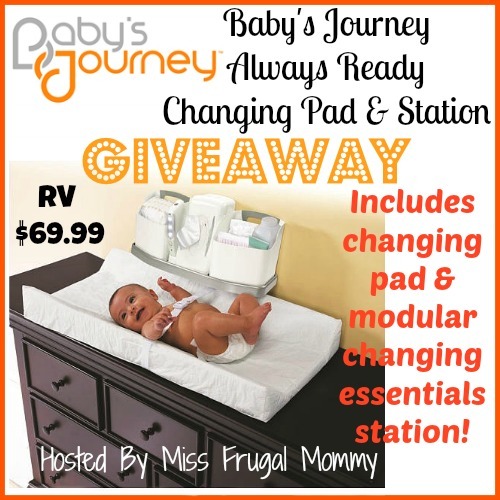 One lucky fan is going to win a Baby’s Journey: Always Ready Changing Station (RV $69.99.) This giveaway is open to US residents 18 and older. Giveaway ends July 12 at 1:00 am EST. Enter to win in the giveaway tools below, all entries will be verified, one entrant per household or you will immediately be disqualified. Winner will be contacted via email and has 48 hours to respond before a new winner is chosen. Prize fulfillment is the responsibility of the sponsor and not the participating bloggers. Good Luck! Their Easy Reach Folding Tub looks awesome! The Babysitter would be great for grandkids on the go! I have wanted the towel warmer in grey/white for so long! I love that they have great customer service and stand behind their products. I also love the Comfy Cozy Tub & Towel Warmer in Frog & Lily Pad. I learned that somebody still makes the big bath sponges like the one my mom loved using for us. How cool to find something like that! I like their SaniLite™ UV Hand Held Sanitizer.